Full of vitamins, fiber, magnesium, calcium, and keeping my pant size tiny. Hello, spinach. I’m learning to love this green leafy vegetable. No, I’m not eating a plateful of cooked spinach for dinner. Although, that did happen once when I was living in France. Host mom invited me to eat lunch with the family one day (they only were required to feed me breakfast and dinner) and when I said yes, I had no idea what I was getting myself into. Turns out a plateful of spinach apparently looks appetizing to some people. She did offer up some cheese for me to sprinkle on top, but that didn’t put a dent into the overwhelming amount of greens I had eaten. Anyway, on a more modern note, I started tossing it into my breakfast. 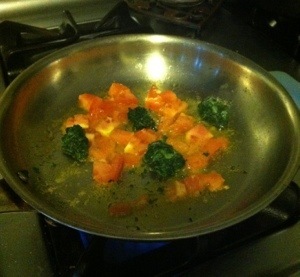 A little olive oil heated in the pan, then tossed in some diced tomato and spinach. Cooked it up, added some garlic powder and let it saute for a few minutes until the tomatoes start to break down. 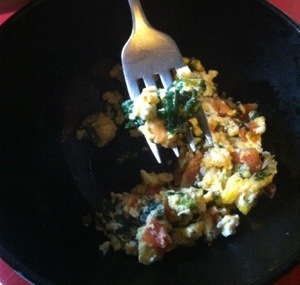 Add in two eggs, scramble and cook until eggs are done. Quick, easy breakfast. And not too much spinach.